Common Ground’s name says it simply: we’re in this together. The environmental challenges facing our planet, and the educational challenges facing our community, are too large to face alone. By working in partnership with like-minded individuals and organizations, we have a real chance of addressing these big challenges: making healthy food accessible to everyone in the community, closing the achievement gap, building a new generation of environmental leaders, re-building our connections to the natural world. In 2015, Common Ground launched a multi-year partnership with Co-Creating Effective and Inclusive Organizations — aiming to build a culture of anti-oppression within our organization, strengthen our capacity for social justice education, and welcome all community members. In 2015, the Regional Water Authority adopted Common Ground High School — creating opportunities to participate in a paid water careers boot camp, bring RWA professionals into Common Ground courses, expand environmental education and green jobs opportunities, access RWA recreational lands, and more. Common Ground High School students can enroll in courses at Southern Connecticut State University and Gateway Community College, and have been able to access critical college scholarships and internship opportunities through their participation in New Haven Promise. For a number of years, Common Ground has partnered with Elm Shakespeare Company, ArtSpace, and other community arts organizations to expand artistic opportunities for our students. Common Ground students participate in a range of community organizations, supported and encouraged by the staff of Common Ground. Many have participated in the Peabody Museum’s Evolutions program, Artspace and Elm Shakespeare summer internship programs, for instance. Common Ground partnered with CitySeed to launch a mobile farm market, sharing food from our urban farm and other local growers with residents in New Haven’s most food insecure neighborhoods. Common Ground also works with CitySeed, the New Haven Food Policy Council, the Community Alliance for Research and Engagement, and others to develop and implement new policies and programs that will get fresh, local food to all the residents in our community. Common Ground is an active part of state-wide and regional efforts to promote farmland preservation and agriculture as an economic development strategy, joining with the Connecticut Food Systems Alliance, Food Solutions New England, the Working Lands Alliance, the Governor’s Council of Agricultural Development, and others. Common Ground is glad to partner with the U.S. Department of Agriculture, Connecticut Department of Agriculture, UConn Extension, and Neighborhood Housing Services to provide gardening workshops for the community. 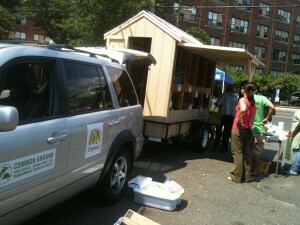 In 2012, the Connecticut School Garden Resource Center was launched through a partnership between Common Ground and the Green Village Initiative, an organization that has started school gardening efforts across Bridgeport and Westport. Through a partnership with Audubon Connecticut, the U.S. Fish and Wildlife Service, and New Haven Public Schools, this work grew to include schoolyard habitats, as well as edible gardens. Today, the School Garden Resource Center provides professional development, infrastructure support, networking opportunities, and other resources to a network of more than a dozen New Haven Public Schools — while also supporting like-minded efforts across Connecticut. 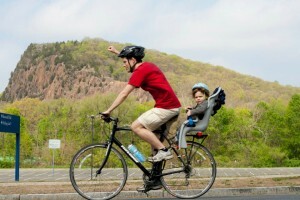 Common Ground is one of the lead organizers for the Rock to Rock Earth Day Ride — New Haven’s largest Earth Day celebration, this year raising more than $100,000 for more than 2 dozen local environmental organizations. Through a collaboration among the U.S. Fish & Wildlife Service, Audubon Connecticut, the City of New Haven, the New Haven Urban Resources Initiative, the Peabody Museum, Common Ground, and others, New Haven has become home to one of the nation’s first urban wildlife refuge partnerships. 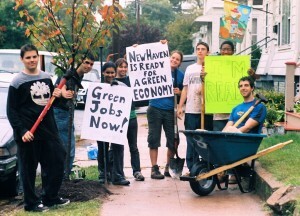 Common Ground partners with the Yale Urban Resources Initiative, Solar Youth, CitySeed, New Haven Land Trust, and New Haven Farms to create the Green Job Corps — an employment and leadership development program that links Common Ground students with meaningful, paid, environmental jobs. Common Ground students have joined with the Connecticut Fund for the Environment to monitor the impact of tide restoration on the West River, and earned stipends for their work. Each summer, Common Ground students take on paid internships on Nature Conservancy-owned land across the country through LEAF: Leaders in Environmental Action for the Future. Common Ground was the nation’s first environmental charter school. Today, there are over 300 environmentally themed schools across the country. We are committed to being a leader in this growing movement. Common Ground launched Teaching Our Cities — an effort to build the capacity of urban public high schools to use the environment as a learning laboratory, and to create a new diverse generation of urban environmental leaders. Common Ground has built a community of practice that connect six urban environmental high schools across the northeast U.S. — supporting our schools in improving our own practices, and sharing what we do with other urban public high schools across the country. Common Ground is also a founding member of the National Green Schools Network, and has partnered with the Connecticut Outdoor and Environmental Education Association, the New England Environmental Education Alliance, and the North American Association for Environmental Education to build capacity for environmental education throughout our state, region, and country. Common Ground works for fair funding and high-quality education through the Northeast Charter School Network. Common Ground’s Kids Unplugged after-school programs builds on a partnership with New Haven Public Schools, providing students in grades K-8 with transportation and discounted program fees to support their participation. More than 60 schools across Greater New Haven participate in our Every Child Outside school field trips program, helping us connect approximately 6,000 kids with first-hand experiences of the farm and forest. A partnership with the Appalachian Mountain Club has helped build an outdoor gear locker on Common Ground’s campus — accessible to our high school adventure club and other youth-serving organizations in New Haven — and has also resulted in training opportunities for Common Ground staff, access to AMC facilities, and jobs for Common Ground students and alumni.